Purchase a series of 3 or more NT Live broadcasts at a time to save 15% on each ticket! Show Image Photograph: Gillian Anderson by Pari Dukovic and Lily James by Perou. Design: Bob King Creative. Cover photo by Jan Versweyveld. 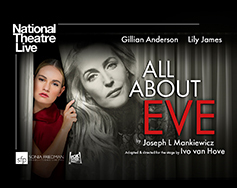 Gillian Anderson as "Margo Channing"
Lily James as "Eve Harrington"
Monica Dolan as "Karen Richards"
Julian Ovenden as "Bill Sampson"
Rashan Stone as "Lloyd Richards"